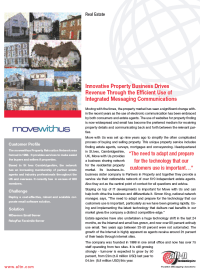 The movewithus Property Relocation Network was formed in 1997. Based in St Ives Cambridgeshire, the network has an increasing membership of partner estate agents and industry professionals throughout the UK and overseas currently with in excess of 600 members. When the company began with one PC and a single email account, few people in the property industry had email and most communication was paper-based. The major internal change occurred in 1999 when the company automated the agent referral system and all staff had full access to the database and email. Previously, the referral system was all fax-based, with sales leads being posted to the relevant estate agents now all communication is electronic using MDaemon and RelayFax as a basis, Simon King, National Network Manager at Move with Us says, “MDaemon has become critical to our business as both estate agents and the public move to electronic communication”. Enter your email address to follow this blog and receive notifications of our new posts by email. How to unlock troublesome Zip backups in BackupAssist? Amazon Lightsail – Removing The Last Barrier Between Your Small Business and The Cloud?